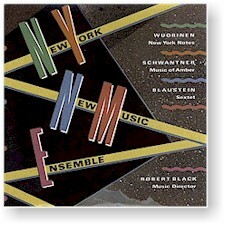 Under the leadership of conductor Robert Black, the New York New Music Ensemble has become one of the most exciting recent additions to New York's contemporary music scene and has established a reputation not only for the virtuosity of its performances, but also for the number and quality of the works it has commissioned. The pieces presented here were all composed for and premiered by the NYNME, and they represent some of the finest works of these three outstanding modern composers, two of whom — Schwantner and Wuorinen — are recipients of the Pulitzer Prize. A composer's panel if ever there was one."